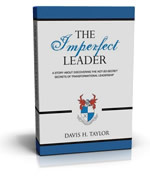 For general contact with Davis Taylor, please complete the contact form below or email Davis@DavisHTaylor.com. If your contact is regarding a speaking request, please compete the speaking form here. where books are sold or online here. "The simple story told in The Imperfect Leader accomplishes what so many other texts on leadership fail to deliver - a straightforward and fundamental analysis of what transformational leaders must do … whether they know it or not."